I HATE writing in Microsoft Word. It’s clunky and distracting. It makes the fear of a blank page more daunting and allows me to wrongfully ail that fear with bells and whistles like font size and header/footer options. Even with all it’s design functionality, I can never quite get the correct layout or find the right font. So, while writing my first full novel, I tried a variety of programs and apps that helped me break away from Word and get through the difficult process of putting words on a page. Simon Haynes, the programmer who created yWriter, says he created the program because he was also a writer and hated trying to make sense of big slabs of wordprocessed files. 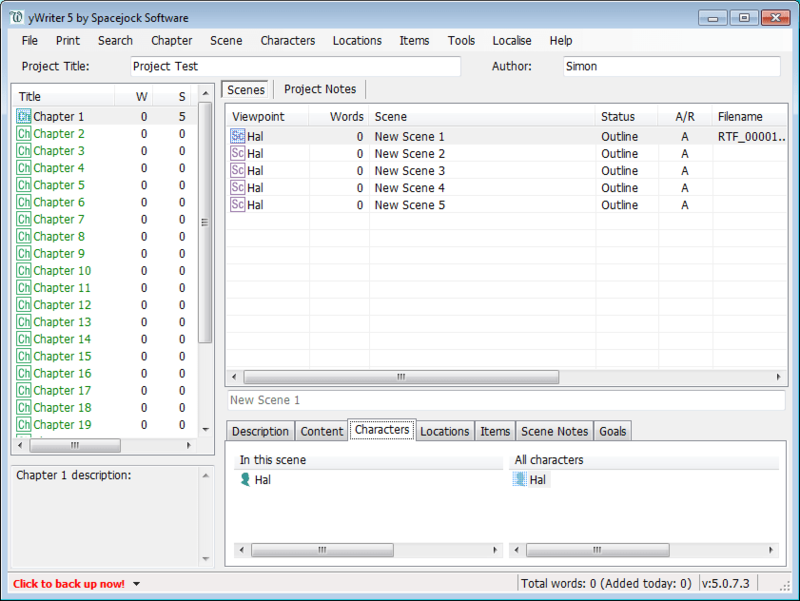 There was a need for organizing all the narrative data so he built a program around his writing process. The beauty of yWriter is that it breaks everything down into scenes and lets the writer create tagged character, item, and location sketches separately. It’s also free! Unfortunately when I ditched my Alienware M15x for the more portable 13 inch MacBook Pro, I had to leave yWriter behind too since it’s only available on Windows. Breaks down the writing process into managable scenes and chapters. Allows writers to organize their thoughts in a way that’s intuitive to the writing process. It’s completely free! and built by a guy who writes novels himself. It’s only available for Windows. Not the most beautiful environment to write in, sporting an outdated 90s software look (but, hey, we all have our own style!). Writers can still find themselves distracted with all the fancy options for managing projects. With a $45 price tag, this isn’t for the casual writer. That being said this is one of the most powerful and versatile writing tools out there. The interface is fully customizable so you can cut out all the crap while writing, then add tools bars once you’re ready to format. Scrivener even lets you export in almost every content consumption format known to man. Perfect for getting that manuscript to your publisher or putting your own eBook on the web. I picked this up when I made the transition from Windows to Mac late last year. I was looking for something to replace yWriter and Scrivener was advertised right on their homepage, so I gave it a try (not without deliberation on the price tag first). Personally, I don’t use it to write too often, but it’s my go-to tool for editing and formatting my work. I’m happy to say it’s well worth the cost, even for the features I use. Perfects what yWriter set out to do, plus cleans up the interface a bit. Makes editing and formatting work a cinche, without taking away from a distraction-free writing experience. Has a huge community backing it, so you can find a tutorial on how to use the features that are right for you and your writing process. It’s a bit pricey for the casual writer. Writers may still get distracted playing with all the options. There’s a bit of a learning curve if you want to use some of the more advance features. 3. iA Writer (Mac, iOS) by Information Architects Inc.
iA Writer is the pinnacle of distraction-free writing. Load it up and you’re presented with a blank light-greyish page, easy on the eyes, with dark-but-not-too-dark grey text in the beautiful and modern Nitti typeset. Fire up full-screen mode and you’ve got yourself a typewriter for the 21st century. Writing in iA Writer is the most zen experience possible. You’ll get sucked into whatever world you’re building, whatever product you’re raving about, whatever recipe you’re blogging. I came to this on the iPhone first after discovering the amazing wonders of Markdown, a writing system that makes formatting text a breeze. The best part of iA Writer is that you can export your Markdown and Text files to .HTML (Webpage), .RTF (Rich Text File), and .DOCX (Microsoft Word) and it builds the formatting in for you. Out of the box, ready to go, simple and easy to use… Just start writing! Starting at $4.99, it’s the most inexpensive paid app on this list. The most distraction-free experience a writer can have, yet exports to some of the most customizable formats out there. To get the full effect, you must learn Markdown (which isn’t difficult to do). Absolutely no formatting options within the app whatsoever—what you see is what you get. No way to organize thoughts and ideas or segment sections of longer text. This is hands-down my favorite program to write in. 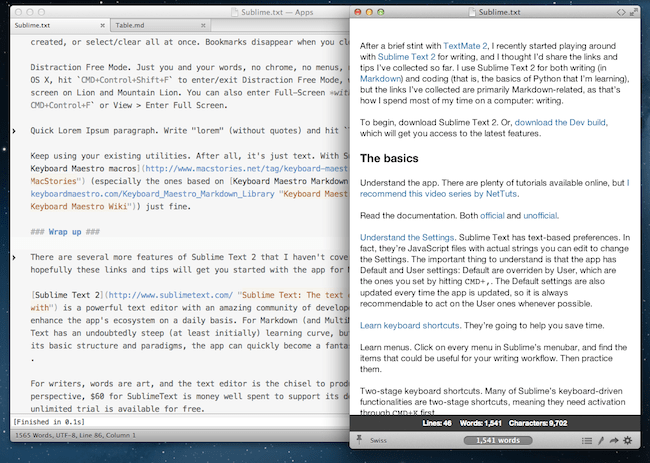 In fact, I’m writing this article in Sublime Text 2. I found it when I was learning how to code HTML and CSS and wanted an alternative to Adobe Dreamweaver that was more customizable than Coda 2. After using it to code for awhile, I realized that it had the potential to be used as a multi-purpose text editor I could use to write articles and individual chapters for my novel. I went on the hunt for the right plugins and eventually built a system that’s perfect for writing content and narratives with Markdown. Of course this took a lot of time and know-how to set up. Check back later for an article about the packages I use and how to set them up to craft the perfect writing environment for yourself too. For now, here’s an article that can help you customize it, though this is less a tutorial than it is a list and it’s filled with a lot of programmer jargon. It’s fully customizable with a huge amount of plugins and if you have a little bit of programming knowledge you can even create your own package and scripts to get exactly what you’re looking for. It’s backed by a huge community that will help you learn how to use and manipulate the program. After some initial set-up, you can create an even more zen writing environment that fits your personality and workflow perfectly. Though you get a free trial that doesn’t seem to end (it just reminds you that you should buy the full product), if you want to get rid of this pesky ad it’s going to cost you $70. It was created for developers and programmers so there’s a lot of set up that can be quite daunting without prior knowledge. It may seem like a waste of time and money to many writers because it does basically the same thing as iA Writer, and setting up can be even more distracting than Word’s formatting options. Believe it or not, I wrote the majority of my novel on an iPad and this app is the reason why. The Soulmen not only have an awesome company name, they build super cool products too. 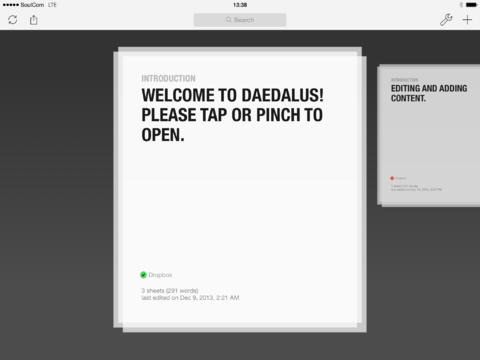 They claim Daedalus Touch is “the world’s sexiest writing app,” and I fully support that claim. There are a ton of text editors on the iPhone and iPad but none quite as unique as this. What makes it so unique is the paper stack concept. The paper stack concept describes how you organize files in the app. First you create a ‘paper stack’ which is kind of like a folder. Within that paper stack, you create pieces of paper. You can write and write and write for as long as you want on one piece of paper, then create another one. This makes something like organizing blog posts or chapters in a novel remarkably simple (and allows you to keep writng and writing without getting hung up on things like page numbers and page breaks). Beautiful writing experience with a unique file structure system and great customization for only $0.99. Supports Markdown and exports to multiple formats including .txt, .pdf, .rtf (which easily opens in Word), and .ePub! Syncs to iCloud, Dropbox and Box.com for easy file transfers, plus has a big brother called Ulyssess III for Mac to make your workflow seamless. The iPad and iPhone are better content consumption tools than content creation tools, so you’d do best to pick up a bluetooth keyboard if you’re thinking about doing some heavy writing with this app. I’ve had issues with syncing to Dropbox after updates and have lost data because of it. There are no formatting options without using Markdown, so the learning curve comes to play again (though it’s well worth the effort). Blogsy (iPad)—For the iPad blogger who wants to publish directly to WordPress, Drupal, TypePad, Tumblr, and lots of other great platforms. Hemingway Editor (Browser App)—For the grammarian who wants to dissect their writing the Hemingway way. Draft (Browser App)—For the Markdownphile who misses Editorially dearly. Celtx (Browser App, iOS, Mac, Windows)—For the screenwriter who doesn’t want to pay for Final Draft because they can barely afford rent. iWriter & PlainText 2 (iPad, iPhone)—For the distraction-free iPhone and iPad writer. Writedown (iPad, iPhone)—For the distraction-free Markdown iPad and iPhone writer. I hope this helps you fellow writers out there find new and exciting ways to get those pesky words onto the page without the distractions of Word’s bells, whistles, and clunky complications. I’d love to hear about your process and which writing apps you use. If I’ve missed any of the good ones, please leave a comment below or find me on Twitter to share! IMAGE CREDIT: I do not claim to own the header image, or any of the images in this post. In fact, I love to support great artists. The image at the top of this post is by an artist I found on Deviantart. You can view the original work plus more of the artist’s work here. Nice article, but it may be a good idea to also mention when there’s a Linux implementation. Sublime, for example, is also available for Linux, I see. Thanks for the heads up! I don’t use Linux so it never even crossed my mind to add that. I’m glad you said something. 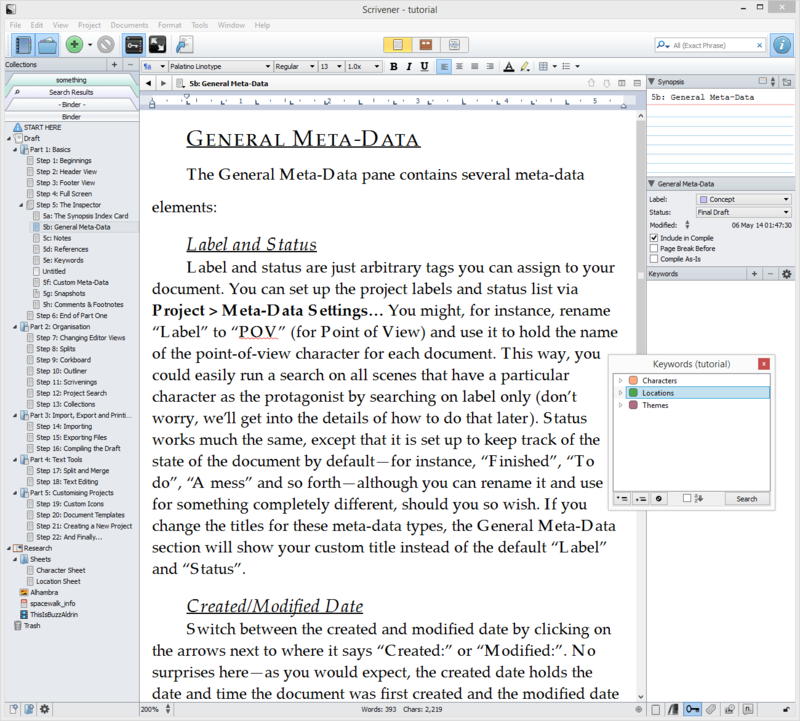 Do you have any other suggestions for Linux-based writing software? Thanks Yusef. This looks like a great option for those who don’t mind working in their browser! I love the design. Nice work. Hi Michael, I like how you address “the fear of the blank page” and its imaginary fix: typesetting features It is interesting to note that while the fear of the blank page amazingly still persists in this day and age, people (young and old alike) are more comfortable writing now than ever before. Why is this? It’s because, where most words are written, that is social platforms, do not use the big blank page for writing words. Nor do they allow you to typeset. They use a tiny little text box. If the pen was mightier than the sword, then the tiny text box on social platforms is the atomic bomb. If word processors adopted the tiny text box model, everyone would be writing the complex documents or books they’ve always dreamed of writing with ease and without fear on the devices or desktops of their choice. Wonderful post. Thanks for sharing such a informative post to us.